I thought I might mention that it is alright to measure when drawing or painting from observation. All too often I see people struggling with aspects of their drawings, trying to get things placed correctly but have trouble figuring out where to do so. Measuring and comparing lengths of a subject in the composition is a good way remedy this. 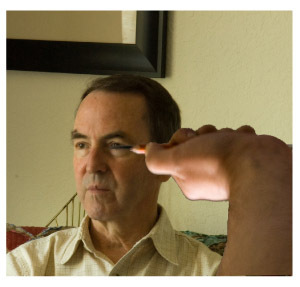 Today, I will demonstrate one way to use your pencil to measure the sizes and positions of features on a face. I use the pencil to compare lengths of parts of the subject I am drawing relative to the lengths of other parts of the subject. In this case I am drawing a portrait. Let’s say I want to find the length of the nose. I can use the pencil to find the distance between the brow line and the tip of the nose. 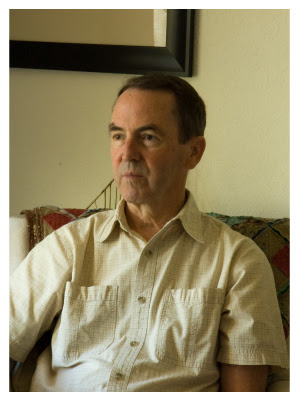 To the right is an image demonstrating this. 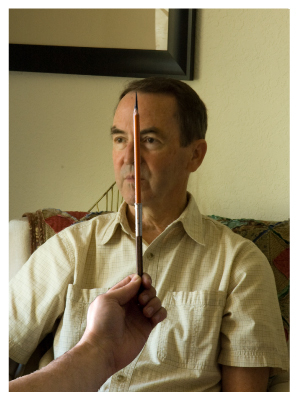 I use the tip of my pencil as one boundary marker of the measurement and my thumbnail as the other. First, I find the top of the length I want to measure. In this case I am looking at where the brow line meets the nose. Holding the pencil along the length of the nose I place the tip of the pencil in front of that area. 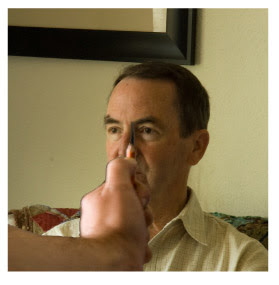 I then I position my thumbnail on the pencil at the base of the nose to mark out the distance I want to measure. I can then compare that measurement to the length of something else on the face to get a sense of the relative length of the nose. In this case, I am using the eye. As you can see the length of the nose is longer than the eye. From my vantage point the length of the nose appears to be about one and a half times the length of the eye. After I draw in the nose, I then can compare the length of the nose in my drawing to the length of the eye I have drawn in earlier. I want make sure the relative lengths compare to the lengths I observed earlier when looking at the model. One last thing, keep your arm straightened out at the elbow when measuring. This will keep the distance between your eye and your hand consistent. If this distance is not consistent than your measurements will not be accurate. You can use this technique for anything you want to draw from observation, whether it be landscape, figure drawing, architectural drawing, still life, etc. Use this as a tool to guide you in finding the right sizes and location of forms within a subject or to find the location of objects in a scene. On a portrait like this I will usually draw the overall size of the head I want as a simple gesture. I then find the size of the eye as it compares to the head and use that to establish the size of the eye in the drawing as it compares to the gesture. From there, I radiate out working on the other features.